Top Rated awards based on customer sentiment and user satisfaction scores. AUSTIN, TEXAS (February 19, 2018) – Journyx, the world’s first web-based time tracking solution, was recently named a 2018 Top Rated Time Tracking Software solution on TrustRadius, a B2B software review platform that helps buyers find and evaluate a variety of software solutions. TrustRadius previously awarded this distinction to Journyx in 2017. 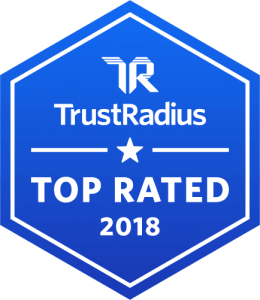 TrustRadius awards a Top Rated title to time tracking software solutions that are in the top tier of their category TrustMap, and have at least 10 user reviews from verified customers. TrustRadius’ TrustMaps and scoring criteria are explained in their Scoring Frequently Asked Questions. Journyx’s time tracking products have always been rooted in project time tracking, allowing project managers to focus on delivering projects, on-time and on-budget – while providing financial and accounting operations the detailed insights they need to drive their companies’ profitability. Last October, Journyx Version 11 introduced the first of its “smart time tracking” features with Suggestions for Microsoft Exchange, and it continues to innovate with the development of more features and tools powered by artificial intelligence (AI) and machine learning. Most recently, Journyx announced the release of Projectlink 11, which allows users to sync time data between both Microsoft Project® and their accounting or Enterprise Resource Planning (ERP) system for easier, more efficient project accounting and budgeting. Coupled hand-in-hand with its robust time tracking and resource management technology, Journyx takes a customer-centric approach to provide the highest value, best-fit solutions and personalized support to all its customers. “We know how valuable time is as a business resource, and how it directly impacts the bottom line,” says Curt Finch, Founder and CEO of Journyx. “That’s why we’re dedicated to helping our customers get the most value possible out of Journyx and providing them with the best tools to enable their success. Founded in 1996, Journyx offers customers two solutions to reach the highest levels of profitability: Journyx – project, time and expense tracking software – and Journyx PX – resource management software that provides work and financial forecasting for a complete picture of project and budget status, employee time and availability. Journyx has thousands of customers worldwide, including Crate&Barrel, Schlumberger, BP, Big Brothers Big Sisters, Callaway Golf, Honeywell and many others. For more information, visit journyx.com.